Michael George Simm, 75, passed away Tuesday, 13 November 2018 at his home in Surprise, AZ. He was born 29 December 1942 in England. 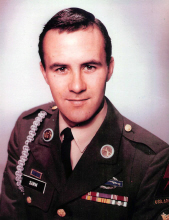 He was a veteran of the Vietnam War and recipient of the Purple Heart and Bronze Star. He married Diane Schultz on 20 November 1970 in Livonia, MI. He worked as a civil engineer for GM, Hughes Aircraft, and Raytheon. Surviving are his wife, Diane Simm, son Geoff (Julie) Simm, daughter Barb (Brian) Smith, daughter Jenn (Brian) Hartman, and 11 grandchildren. In lieu of flowers, donations can be made to Meals on Wheels.